In the era of consumerism, healthcare providers are slowly but steadily, shifting focus from fee-for-service to a fee-for-value reimbursement model. 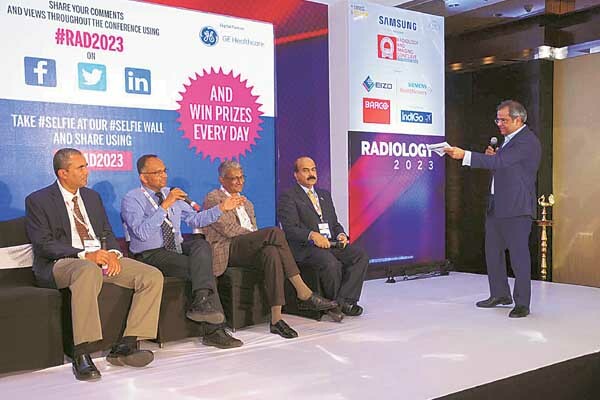 The panel discussion on ‘Adding value in radiology’ brought to light various viewpoints from leading radiologists on how this fraternity can add value to patients and the entire healthcare system in India. The panel comprising Dr Bharat Agarwal, Chief Radiologist, Max Healthcare (moderator), Dr Arjun Kalyanpur, Chief Radiologist, Teleradiology Solutions, Dr Nobhojit Roy, National Advisor, Public Health Planning & Evidence, NHSRC, Dr Bhavin Jankharia, Chief Radiologist, Picture This by Jankharia and Dr K Mohanan, President, IRIA deliberated on fundamentals and pre-requisites by which radiologists can add value. The panelists also raised questions on the role of the government to create value amongst radiologists within the country. Also, experts in the panel informed that improving access is one of the most important goal in the ministry. Radiology will soon be integrated with Ayushman Bharat scheme. Is the industry ready for this leap? Secondly, the panel also contemplated on the impact of the government’s move to bring price cap for medical devices and healthcare services. Will there be a price cap for radiology services as well? These were some concerns raised during the panel discussion. Moving forward, panelists also discussed on how radiologists in the coming years will need to look at monetary valuation. Experts spoke on how radiologists will have to look beyond image reading and evolve themselves to take part in clinical decision making. While discussion the prospects for the transformations in the business of radiology, panelists pondered on how large volumes, with small profit margins will be the new normal. The audience, also joined the discussion and raised pertinent questions.